The new method to create a screenshot in Windows 8.1 or Windows-10 and to auto-save it as a file! Via keyboard shortcut [Window-Logo + PrtScn] Windows-8 auto-saved inside the screenshot file in "Screenshots" folder, created in your My Pictures folder. This location is %UserProfile%\Pictures\Screenshots. ( ... see Image-1 Arrow-1). The old method to create a screenshot in Windows and copy a screenshot into the clipboard works also on Windows-8. [Alt+PrtScn] for the active Window or [PrtScn] for the completly Desktop. You can use mspaint.exe to save a screenshot to a file! 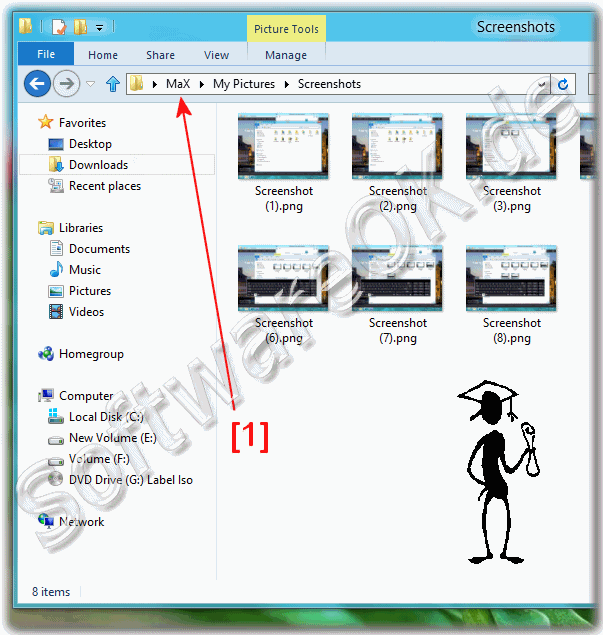 (Image-1) Create a screenshot in Windows 8.1 or 10 and auto-save it as a file! (Image-2) Use mspaint.exe in Windows 8 to save a screenshot to a file!! Sometimes it's easier to show someone what's on your screen than it is to explain it. Windows makes it easy to take a picture of the screen so you can save, print, or share it. This is referred to taking a screen shot or screen capture. You can take a screen shot and automatically save it as a file, take a screen shot without saving it as a file, or take a screen shot of only one window (instead of the whole screen). Howto save a sindows screenshot as a pdf windows? How to save on windows 8.1 or Windows 10? How to make a screen shot a pdf file? Automatic creation of files from screenshot pdf? Screenshots windows 8,1 and 8 in wordpad opslaan? How create pdf of screenshot in microsoft windows? How to save a screenshot as a pdf? Take a screenshot and save automatically? Windows 8 one click screenshot save? Screenshot save automatically in drives? What to do if the image captured is not saving in win 8.1 or Windows 10? Windows 8 create an iso file with screenshot? Create a screenshot in windows 8.1 or Windows 10? Take a screenshot and save as PDF? Windows screenshot auto save or Window 8.1 screen to pdf? How to save a screenshot on windows 8.1 or Windows 10? Saving a screen shot as pdf microsoft? Screenshot computer screen to PDF file? How to save screenshot in Win 10? How to screenshot in windows 8 of a pdf? How to do screenshot on windows 8 and save it? How to set automatic screenshot in window 8.1 or Windows 10? Pdf files from screen shots? Taking screenshots as pdfs in windows 8? Take a screenshot of only one window and automatically save it? How to screen shot and save in folder? How to restore screen shot file to windows 8.1 or Windows 10? How to do screen shot in pdf? Auto screen shoot in windows 10? Automatically save screenshots windows 8.1 or Windows 10? Screenshot windows 8 save as file? Windows create file with screenshots? How to take a snapshot from a pdf file on windows 8.1 or Windows 10? How to save a screen shot as pdf? Pdf reader how do i get a screenshots windows 8.1 or Windows 10? Screenshot windows 8,1 and 8 save? How to save a screenshot to pdf? Save a screenshot on windows 8? How to save screenshot on windows 8.1 or Windows 10? How to generate screenshot windows 8.1 or Windows 10? How to make screenshot from pdf file? How to change screenshot settings in windows 8.1 or Windows 10? Create ISO file screen shot windows 8.1 or Windows 10? How do i save screen shot in windows 8 and save to documents? Win 10 save screenshot as file? Windows how to sace screenshot to desktop? Windows 8 how to save 1 page from a document? Save scrren pages on windows 8? Windows 8.1 print screen and automatically saves as a file? Windows 8,1 and 8 create screen shot files? How to save screen capture to pdf windows? How to make a shap shoot of a document? Screenshots windows 8 in wordpad opslaan? Windows 8 screen shot to file? Screenshot windows 8.1 or Windows 10? Hhow do I put the screen shot in documents on windows 8.1 or Windows 10? How to automatically take a screenshot on windows 7 when someone downloads software? Snap multiple screen shots back to back and save to a folder? How to a save a screenshot as file from windows 8.1 or Windows 10? 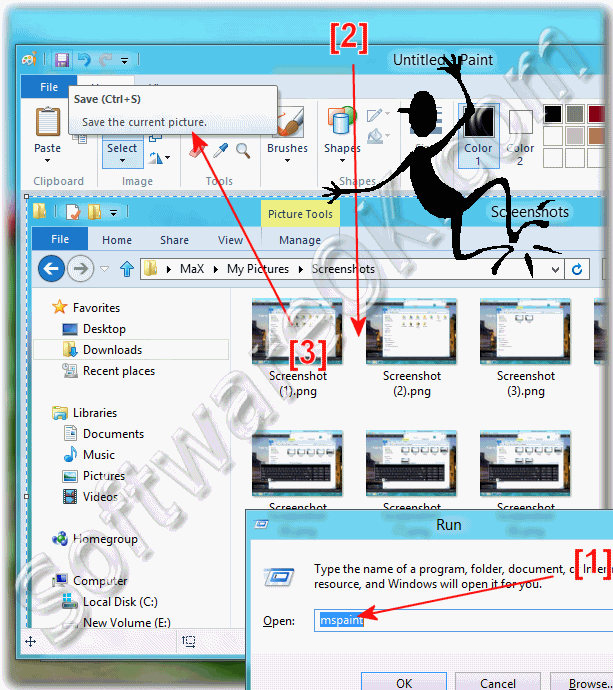 How to create iso file for windows 8.1 steps with screen shots? Windows 8.1 where save the photos? Upload screenshot on windows 8? Windows 8 get screenshot file back? How to take screenshot in windows 10 pro? How to screen shot windows 8 laptop and make file a pdf? How to take a screen shot of only one window in window 8.1 or Windows 10? How to save screenshot as pdf? How to create training documents in windows 8 with screen shots? Save screen shot as pdf? Where do i create a screenshot file in windows 8.1 or Windows 10? How to get a screen shot in pdf? Windows 8.1 not saving captured Screenshots in Pictures folder? How to save screenshot as a pdf? Screencap autosave in Win 10? How to save a screen shot as a pdf? How do you take a snapshot in pdf in windows 8.1 or Windows 10? Save a screenshot as pdf? How to make screen shots in laptop 8.1pro? Windows 2008 auto screen shot? How to autosave screenshot on windows?